All Florida residents must register their vehicles and obtain valid license plates. You can choose to get the state’s standard license plate or choose from an assortment of specialized styles. When you register your car or motorcycle in Florida, you must also obtain validation stickers. After registering your vehicle, you’ll obtain 1 or more license plates to place on your vehicle. 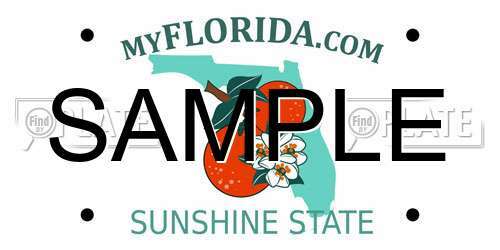 Standard Florida license plates have oranges and blossoms with an outline of the state of Florida in the centre of the plate. In addition to the standard license plate, you can also choose to personalize your plate (vanity plates), get specialized plates, or apply for disability plates. Remember, you must put your validation stickers on the upper right corner of your license plate. The month and year of expiration must be clearly visible. The cost of registering and renewing personalized plates are $15 in addition to the standard fees to order or renew. Fees for these plates start at $20 and up. You’ll also have to pay for the standard registration fees and, some plates require an obligatory donation. If you want to support a particular organization or show off your passion for what you love, these are the plates to get. When you purchase a new vehicle in the state of Florida, the dealership should provide you with a temporary plate. If you are purchasing a vehicle from a private sale, you must obtain a temporary plate in advance. However, to do so, you must visit your local tax collector to complete a vehicle transfer. Temporary plates are valid for 30 days and permit you to drive your car while your title and license plates are being processed. You have 30 days to register your vehicle if you become a Florida resident or purchase a new vehicle. To register your vehicle, you must go to the Department of Highway Safety and Motor Vehicles (DHSMV) in Florida. If you’re new to Florida, you’ll have to apply for a Florida driver’s license and get new insurance for your vehicle. Once you have all the necessary documents, you can submit your registration. When you do, you may also have to pay sales tax on your vehicle. Contact your local DHSMV for more information. Once your application has been received and your payment processed, you may be able to receive your license plate and sticker right away. In this case, you can put your license plate onto your vehicle and put the validation stick on the upper right corner. If you decided to go with a specialized or personalized license plate, it’ll take a few days to process and send the license plates to you. In this case, you must maintain your temporary permit to legally use your car on the roads in Florida. Did you lose your license plates? Maybe they were stolen? If you have one of your plates or damaged plates, you must surrender them to the DHSMV. When you surrender your license plates, you can provide them in person or mail them to your county tax collector. The cost of registering a vehicle in Florida is significantly greater than renewal. You should contact your local DHSMV office to obtain an accurate quote for your vehicle. If you want to obtain a bit of background information before purchasing a used vehicle, you can look up the license plate. Try FindByPlate to get the most updated data on license plates in Florida.